. Stay on all boardwalks and trails in hydrothermal areas and keep children within reach.
.	Pets are not allowed in hydrothermal areas.
. Swimming or bathing is prohibited in hydrothermal pools or streams where water flows entirely from a hydrothermal source.
.	Be aware that toxic gases exist in some hydrothermal areas. If you feel sick, leave the location immediately. 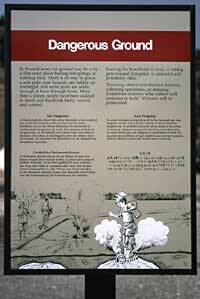 Is it really dangerous to walk off the boardwalk in geyser basins? Yes! Geyser basins constantly change, making it impossible to guess a safe path. Also, the ground may be only a thin crust over boiling water or scalding mud, with some pools acidic enough to burn through boots. Many people have been injured by breaking through the fragile surface, and some people have died from falling into hydrothermal features. Why can’t I bring my dog on geyser basin trails? Dogs don’t seem to recognize the difference between hot and cold water. Some have died by jumping into hot springs. Dogs may also disturb wildlife and are prohibited from all park trails. Why can’t I smoke in the geyser basins? Litter of any kind can clog the vents of hydrothermal features, thus altering or destroying the feature. Cigarette butts quickly accumulate if smoking is allowed. Also, sulfur deposit exists in hydrothermal areas, and they easily catch fire, producing dangerous—sometimes lethal—fumes. Why isn’t swimming allowed in the hot springs? The water in hydrothermal features may be scalding and /or very acidic. Also, thermal water can harbor microorganisms that can cause a fatal meningitis or Legionnaire’s disease.